It is often important to be able to determine the localization of myocardial infarction and ischemia, as well as being able to determine which coronary artery that is iccluded, and where the occlusion may be located. As discussed below, this may facilitate diagnosis of ischemia and infarction, and it may also guide management. For example, administering nitroglycerin (to alleviate ischemic chest pain) may cause hemodynamic collapse in patients with right ventricular ischemia/infarction; therefore, it is crucial to recognize ECG signs of right ventricular ischemia/infarction. Most clinicians will benefit from this knowledge. For cardiologists – particularly interventional cardiologists – this knowledge is of paramount importance as they must be able to directly pinpoint where the coronary artery occlusion is located (it affects the selection of coronary catheter). The term culprit – which means “the guilty one” – is used to denote the occluded coronary artery. In the vast majority of cases, it is only possible to determine the ischemic/infarct area (and thus the culprit) if the ECG displays ST segment elevations. However, there are a few distinct ECG syndromes (e.g Wellen’s syndrome, de Winter’s sign, global ST segment depressions) in which it is possible to determine the ischemic/infarct area despite the absence of ST segment elevations. The right coronary artery (RCA) originates on the right aspect of the aortic bulb. The left anterior descending coronary artery (LAD). The left circumflex coronary artery (LCX). 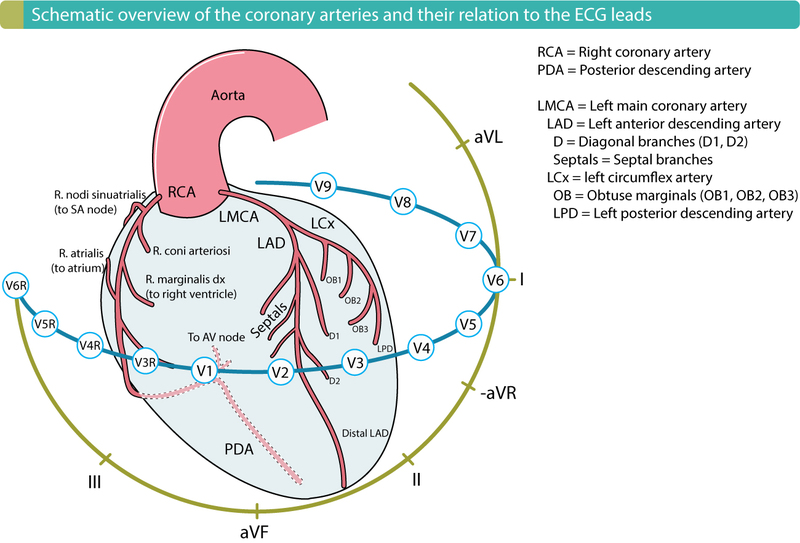 Figure 1 is important, as it shows the coronary arteries and their relation to the ECG leads. Note that Figure 1 is a right-dominant system (i.e PDA is supplied from RCA). Figure 1. The coronary arteries and their relation to the ECG leads. Localization of myocardial infarction / ischemia is done by using ECG changes to determine the affected area and subsequently the occluded coronary artery (culprit). The coronary artery that supplies the PDA (posterior descending coronary artery), which supplies the inferior wall of the left ventricle, determines the coronary artery dominance (Figure 1). A right-dominant system implies that the PDA is supplied by the right coronary artery (RCA). A left-dominant system implies that the PDA is supplied by the left circumflex coronary artery (LCX). Right-dominant system is by far the most common anatomy, occurring in 90% of all individuals. 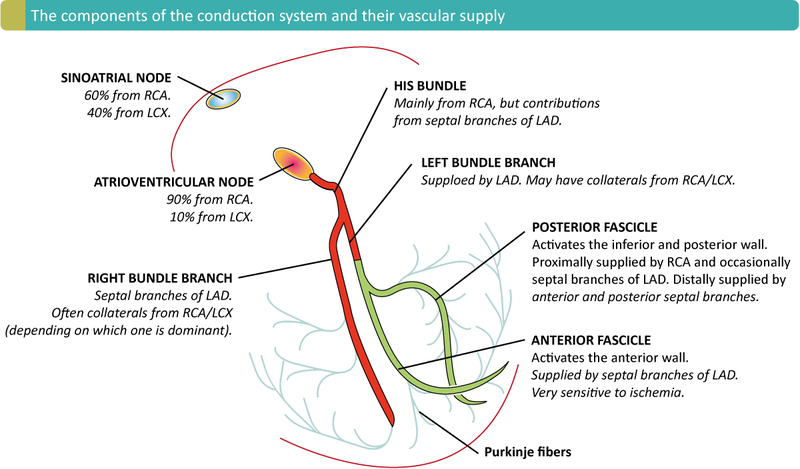 Figure 2 is also important to study, as it shows the arterial supply of the conduction system. Figure 2. The arterial supply of the conduction system. As seen, the sinoatrial node is supplied by the right coronary artery in 60% of individuals, and by the left circumflex artery in the remainder. The atrioventricular node is supplied by the right coronary artery in 90% (right dominant system) of individuals, whereas the in the remaining 10% the supply comes from the left circumflex artery (left dominant system). It is possible to localize the ischemic area by using the ECG if there are ST-segment elevations. The reason why ST-segments are indicative of the ischemic area has been discussed (read ST-T changes in ischemia). Briefly, the ECG leads that display ST-segment elevations do reflect the ischemic area. Hence, ST-segment elevations in leads V3–V4 are caused by transmural ischemia located in the anterior wall of the left ventricle. ST-segment elevations in leads II, aVF and III are due to transmural ischemia located in the inferior wall of the left ventricles. 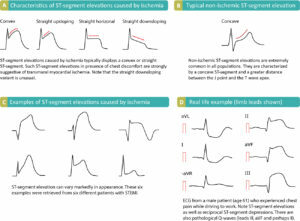 Table 1 shows an overview of the relation between leads with ST-segment elevations and ischemic area. An exhaustive discussion follows below. V5–V6 Apical Distal LAD, LCx or RCA. II, aVF, III Inferior 90% RCA. 10% LCx. V7, V8, V9 (reciprocal ST depressions are frequently evident in V1–V3) Posterolateral (also referred to as inferobasal or posterior) RCA or LCx. Overview of the relation between leads with ST segment elevations and ischemic area. Localizing the ischemic area in NSTE-ACS/NSTEMI is much more difficult because leads with ST-segment depressions do not reflect the ischemic area. The electrophysiological explanation to this has been discussed previously (read ST-T changes in ischemia). Thus, ST-segment depressions in leads V3–V4 do not necessary imply that the ischemia is located to the anterior wall. Therefore it is commonly stated that ST-segment depressions (as well as T-wave inversions) cannot be used to localize the ischemic area. There are two notable exceptions to this rule, namely Wellen’s syndrome and de Winter’s sign, both of which are caused by proximal occlusions in the LAD and thus cause anterior wall ischemia/infarction. Note that the discussion so far only concerns the left ventricle. Specification of the ischemic/infarct area refers to the walls of the left ventricle. For example, the expression anterior infarction implies infarction of the anterior wall of the left ventricle. Similarly, inferior infarction implies infarction of the inferior wall of the left ventricle. Right ventricular infarction is uncommon (it occurs if an occlusion is located in the proximal RCA). Figure 3 shows the walls of the left ventricle, and the ECG leads reflecting these walls. Localization of the ischemic area will now be discussed. The right coronary artery supplies the entire right ventricle via the right marginal artery (r. marginalis dx). In 90% of individuals the right coronary artery gives off the posterior descending artery (PDA) which supplies the inferior wall of the left ventricle. When the RCA gives off PDA, the anatomy is referred to as right-dominant system (if the Lcx gives off PDA, it is referred to as left-dominant system). In patients with right-dominance the RCA supplies the atrioventricular (AV) node. In 60% of individuals the right coronary artery gives off branches to the sinoatrial (SA) node. The posterior third of the interventricular septum is supplied by the right coronary artery. Arteries to the posterior wall (these arteries branch of after the right marginal artery) may be given off by the RCA (and otherwise the LCx). Occlusion in the RCA causes inferior wall infarction in individuals with right-dominance (i.e if the RCA gives off the PDA, which is the case in 90% of all individuals). If the occlusion occurs proximally, it may affect the blood supply to the right ventricle and thus cause right ventricular infarction (this is uncommon). Occlusion in the RCA may also cause posterior wall infarction. Details follow. Inferior wall infarction causes ST-segment elevations in leads II, III and aVF. The ST-segment elevation is highest in lead III and the majority of cases display reciprocal ST-segment depressions in lead aVL and I. Inferior and posterior (inferobasal) infarction – Posterior wall infarction occurs if the arteries supplying the posterior wall are affected. This causes ST-segment elevations in lead II, III, aVF, V7, V8 and V9. Reciprocal ST-segment depressions are seen in V1–V3, aVL and I. It is common that V1–V3 displays unusually high R-waves and positive T-waves during posterior wall infarction (these are reciprocal changes to posterior Q-waves and T-wave inversions, respectively). 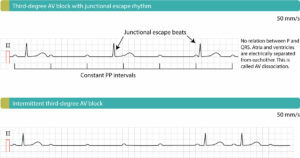 Inferior infarction and right ventricular infarction – None of the standard leads in the 12-lead ECG is adequate to capture the injury currents arising in the right ventricle. It is a common misunderstanding that V1 and V2 records right ventricular activity (V1 and V2 primarily observes the electrical activity of the interventricular septum). However, V1 and V2 may occasionally display ST-segment elevations during right ventricular infarction (the elevations should be higher in V1). To verify right ventricular infarction one must connect the right sided chest leads (V3R, V4R, V5R and V6R, which show ST-segment elevations). Since infarction of the right ventricle affects treatment alternatives, it is recommended that these right sided chest leads be used if there is suspicion of right ventricular infarction. 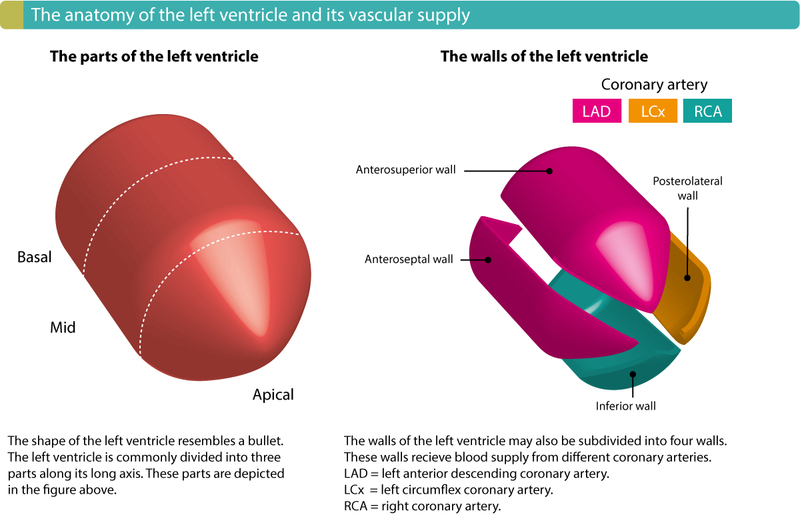 Note that the ST-segment elevations in right ventricular infarction have much shorter duration than infarction of the left ventricle (because the right ventricular wall is much thinner than the left, and therefore the infarction is completed faster). The LAD supplies the anterior two thirds of the interventricular septum (this area is referred to as anteroseptal area). The LAD supplies the large anteriosuperior wall (often referred to as the anterior wall) and the apical part of the lateral wall. The LAD may stretch all the way to the inferior wall and supply its most apical area (this area is referred to as the inferoapical area). Occasionally the LAD is very long and supplies a significant portion of the inferior wall; this type of LAD is called wrap-around LAD (because it wraps around the apex). Occlusion in the LAD causes anterior infarction. ECG changes and extension of the infarction depend heavily on the site of the occlusion. The more proximal the occlusion the greater the infarction and the more pronounced ECG changes. ST-segment elevations may be present in leads V1–V6, and frequently aVL, I (the latter two may be affected because the diagonals given off by the LAD supplies the apical part of the lateral wall). There are virtually always reciprocal ST-segment depressions in III and aVF. Proximal occlusion in LAD – Proximal occlusion in LAD causes massive infarction involving the basal parts, anterosuperior wall, lateral wall and the interventricular septum. The more proximal the occlusion, the more leads display ST-segment elevation. Occlusion proximal to the first septal and diagonal branch causes ST-segment elevations in V1–V4, aVL and I, as well as reciprocal ST-segment depressions in II, III, aVF, -aVR and, frequently, V5 (occasionally V6). New right bundle branch block is common. Occlusion between the first septal and first diagonal usually spares the interventricular septum (absence of ST-segment elevation in V1). Distal occlusion in LAD – Occlusion distal to the first diagonal and first septal will spare the basal parts of the anterior wall. The ST-vector will be pointed more downward. ST-segment elevations are seen in V2–V6. There are no ST-segment elevations in V1, I or aVL, and no reciprocal ST-segment depressions in II, III, aVF and -aVR. Occlusion in a long LAD (“wrap around LAD”) – If the LAD is very long and supplies a significant portion of the inferior wall, occlusion may cause inferior ST-segment elevations. Thus, a very distal occlusion in the LAD may be somewhat deceptive. Noteworthy – Occlusion in the first diagonal may cause ST-segment elevations in aVL and I, without any other noteworthy ST-segment elevations. Occlusion in the main septal branch may cause ST-segment elevations in V1–V2, and reciprocal ST-segment depressions in V5, V6, II, III and aVF. It should also be noted that recent studies with magnetic resonance imaging has revealed that what was once firmly believed to be a septal infarction (i.e ST-segment elevation in V1–V2) appears to be more of an apical infarction. In 90% of individuals the coronary circulation is right-dominant, meaning that the PDA is given off by the RCA. In these individuals the LCx only supplies the basal and mid parts of the posterolateral wall. As discussed previously, this part of the left ventricle is difficult to capture with the conventional leads in the 12-lead ECG. In 10% of individuals the coronary circulation is left-dominant, meaning that the PDA is given off by the LCx. Thus the LCx supplies the inferior wall in 10% of all individuals. The LCx supplies the AV-node in 10% of all individuals. Posterior (posterolateral, inferobasal) infarction – If the LCX only supplies the posterolateral wall, occlusion will lead to posterolateral infarction (also referred to as posterior or inferobasal infarction). 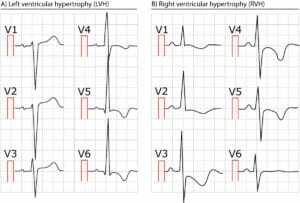 ECG changes resemble those seen in posterior infarction due to occlusion in the RCA, namely ST-segment elevations in V7–V9 and reciprocal ST-segment depressions in V1–V3, along with high R-waves and positive T-waves in the same leads (V1–V3). Inferoposterior infarction – If LCx gives off PDA, occlusion will cause inferior infarction as well, and thus ST-segment elevations in II, III and aVF (occasionally also in aVL, I, but rarely V5–V6). Because LMCA is the origin to LAD and LCX, occlusion will cause massive infarction, with very poor prognosis. One should suspect occlusion in the LMCA if there are ST-segment elevations in most ECG leads (in persons with left-dominance, it will include the inferior wall).